The principal of a Derry Primary School has spoken of her disappointment after three windows were smashed in a night of violence on the Galliagh estate. Catrina McFeely, Principal of St Paul’s Primary School, however, praised parents who have been arriving at the school early this morning to offer their help to clean up the mess. 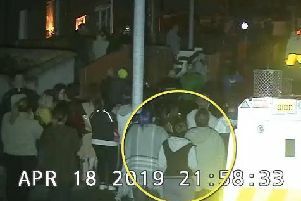 Despite disturbances in the surrounding area along Moss Road last night, the school has reopened this morning and the children’s Fancy Dress Hallowe’en party. Mrs McFeely said some of the children had expressed anxiety that last night’s events might have resulted in the event being cancelled. “We had windows broken but no further damage, three windows in the main building. Teachers and teaching staff are just devastated. “There is pensioners houses opposite us and I am sure the older people were feeling really terrified. Mrs McFeely said that despite the trouble, the children have been “all buzz” this morning for the fancy dress party. Meanwhile the Fire & Rescue Service confirmed that units from Crescent Link Station were called to the Moss Road area on several occasions last night. It is the biggest disappointment but we have had such support from our parents. They all turned up early to see if there was anything they can do to help with the cleaning up. The first call out occurred at 7.04pm following reports of rubbish on fire on the road. The Fire Service said that no action taken as there was no risk to property. A second call out occurred at 7.33pm, when two mattresses were reported on fire on the road. Again the fire was allowed to burn as there was no risk to property. A third call out happened at 9.57pm with rubbish on fire again. The fire was extinguished. The spokesperson said that on each occasion that there was a “very large group of youths in the area”. They added that despite reports police and the fire service came under attack, there was “no damage to the Fire Appliance” or injuries to fire personnel during any of the episodes. “A Fire Appliance from Crescent Link attended all these incidents,” the spokesman added.